Nurses in Vermont are on strike not just for better pay, but for a system that puts patients over profits. Ranked forty-seventh for pay in the nation. High turnover, stagnant wages, and chronic staffing shortages — sound familiar? You’d be forgiven for thinking these figures refer to the working conditions of West Virginia teachers, or those in any of the red states that erupted in strikes during this spring’s teacher rebellion. But, in fact, these figures describe the daily realities confronting nurses in none other than the widely hailed progressive state of Vermont. 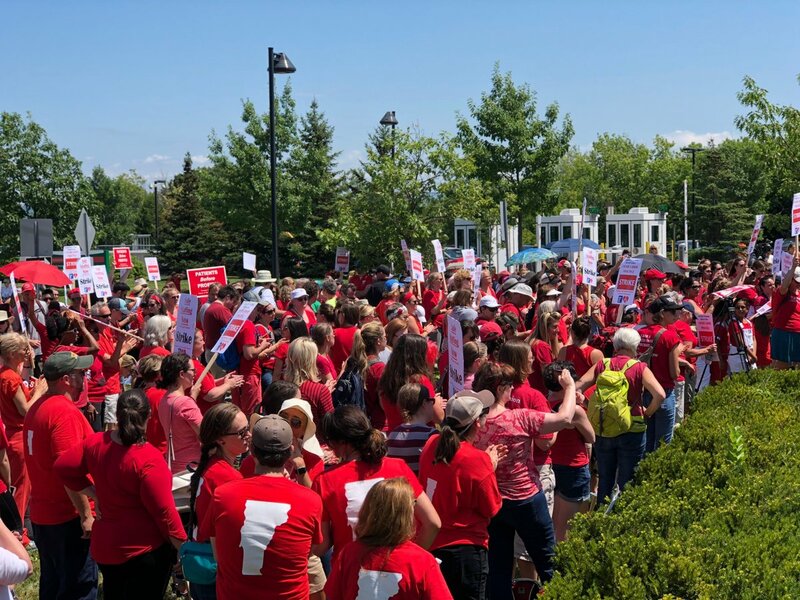 On Thursday, 1,800 nurses and three hundred health professionals at the University of Vermont Medical Center (UVMMC) began a two-day strike to demand more for themselves and their patients. At the center of the strike are issues related to safe staffing, competitive pay, and calls for a hospital-wide $15 minimum wage. One of the central demands is for safe-staffing ratios, which the union representing the nurses, the Vermont Federation of Nurses and Health Professionals (VFNHP), sees as intimately connected to workers’ pay. The hospital ranks among the lowest for pay in a state that ranks forty-seventh in the nation for nurses’ wages, adjusted for cost of living. The longest-serving nurses at the hospital have not received a pay increase in nine years. The VFNHP reports that low wages contribute directly to staffing issues because the hospital cannot recruit and retain workers. The UVMMC, a level-one trauma center and the second-largest employer in the state, routinely has vacancies of between 130 and 180 positions. To compensate for these shortages, the hospital spends exorbitant sums of money to employ traveling nurses for thirteen-week stints. The union claims that in some cases the hospital gives scheduling preferences to these traveling nurses. In addition to low wages, the UVMMC employs lean production methods that put both nurses and patients at risk. The union claims that the hospital has frequent shortages of support staff, including nurses’ aides and orderlies. According to Tristin Adie, a nurse practitioner and member of the bargaining committee, nurses in the rehabilitation unit routinely do laundry for up to an hour a day, while nurses in the oncology unit are consistently tasked with billing and coding duties, and nurses across the board are forced to regularly clean rooms and accompany patients to far-off places in the building. Adie says that such practices directly contribute to an unsafe working environment: nurses cannot adequately care for patients when they are forced to do the work of support staff in addition to their primary duties. As Vermont senator Bernie Sanders noted in a July 6 press conference in support of the nurses, “I find it really hard to believe that the hospital has enough money to pay nearly $11 million to fifteen administrators, including more than $2 million to the CEO (John Brumsted), but apparently doesn’t have enough money to pay their nurses the same wages as nurses earn just across the lake in Plattsburgh, where the cost of living is, in fact, lower.” The hospital is also no longer hurting for cash: its total operating budget is $1.2 billion. Meanwhile, UVMMC’s chief financial officer, Todd Keating, disclosed that the hospital has more than 220 days of operating cash on hand. The $15 minimum wage was one plank in a broader strategy of deep internal organizing by the union that began over a year ago. Frustrated over previous concessionary contracts, the union began building a network that would provide rank-and-file workers with the confidence to stick it out at the bargaining table and win key demands, including a 24 percent wage increase on par with the salaries of nurses at Champlain Valley Physician’s Hospital in Plattsburgh, New York, which is also part of the University of Vermont Health Network. The VFNHP formed member action teams that put rank-and-file members in leadership positions and enabled the union to achieve a 94 percent vote to approve the strike from its membership. A coalition of left groups including the International Socialist Organization, the Democratic Socialists of America, and the Vermont Workers’ Center formed the group “Alliance in Support of UVMMC Nurses,” holding educational events and a picket in support of the strike. A new hashtag and Facebook page, #RedforMed, is taking a cue from the solidarity campaign #RedforEd in support of the teachers’ strike in Arizona, encouraging supporters to post photos of themselves wearing red in support of the strike. On the picket line, community groups and nurses from the New York State Nurses Association and Massachusetts Nurses Association will be joining the VFNHP. UVMMC’s management, on the other hand, has been intransigent. Late Wednesday night, union member Phillip Macomb noted in a Facebook post that the union had offered a compromise in “the hopes of settling this contract and avert[ing] a work stoppage,” but that management rejected the proposal and refused to negotiate. This refusal comes on the heels of a campaign of bullying and intimidation by management throughout the bargaining process, according to striking nurses. The union has filed a total of twenty-one unfair labor practice charges against management, including attempts to prevent union staffers from coming on site, taking down union fliers, and refusing to seat key decision makers — hospital executives — at the bargaining table. The strike, slated to be one of the most significant in the region in years, comes on the heels of the wave of recent teachers’ strikes in the United States, as well as a massive, ongoing strike involving thirty thousand nurses in New Zealand. Scholars have linked the labor activism of nurses and teachers, not only because they are both female-dominated professions but also because of the strategies they use to organize. In their book Caring for America, Eileen Boris and Jennifer Klein refer to these strategies as “care worker unionism.” Boris and Klein argue that care worker unionism draws a straight line between working conditions and the broader social welfare system — health care for nurses, public education for teachers — which defines the conditions of “care.” Care workers have thus had to advocate for larger social goods as part of their demands for expanded workers’ rights. Nurses, like teachers, often face the sidelining of their concerns as workers in favor of the paramount needs of the recipients of their care. What about the patients? is a common hypothetical question meant to discredit any strike or work disruption among health care providers. But Vermont nurses know that the two issues are not counterposed: if the care of patients is to be valued at all, the providers of that care must themselves be valued and materially supported.